Uh-oh. It’sDecember again. Time for His Grinchiness to reappear (in a moldy green costume that matches his disposition) to growl, grumble and glower about all those happy, smiling Whos down in Whoville. But instead of just staying up there in his frigid digs on Mt. 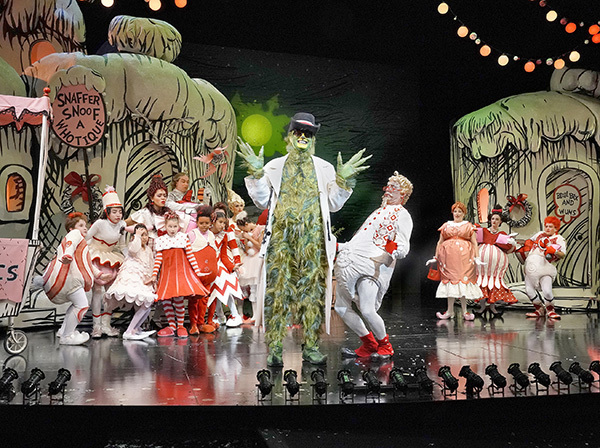 Crumpit and ignoring them, the Grinch (Ed Watts) wants to meddle and make everybody in Whoville as miserable as he is. “Dr. Seuss’s How the Grinch Stole Christmas!” is narrated by Old Max (Steve Gunderson), the Grinch’s old dog who has retired and is about to move away. Old Max narrates the story as he looks around the old homestead one last time. The thing that really gets the old grouch’s goat is Christmas, that cheery time when everybody runs out to buy gifts for friends and family, sings happy holiday songs, and plans a big feast with roast beast. The Grinch can’t stand all that cheer, and vows to put an end to it. This year, he gets a wonderful, awful idea: he’ll go down to Whoville and steal Christmas. Surely when everybody wakes up to no gifts, no stockings hung by the chimney with care and no dinner fixings, that’ll do the trick. His poor dog Young Max (Tommy Martinez) is forced to go along when the Grinch dresses Western style (complete with a 10-gallon hat) and goes down to Whoville to case the joint. They bump into several Whos, who think the Grinch weird but graciously invite him to dinner the next night. You know what happens: the Grinch — and poor, unwilling Max — come to dinner and wait until everyone’s in bed. Then the green menace grabs all the packages, stockings and even the Christmas tree and stuffs them all up the chimney. Then they pack the “sleigh” (powered by poor Max) and whisk all the goodies away to Mt. Crumpit. But what the Grinch doesn’t count on is little Cindy-Lou Who (the irresistibly adorable Sadie Tess Coleman) and her ability to touch his two-sizes-too-small heart. 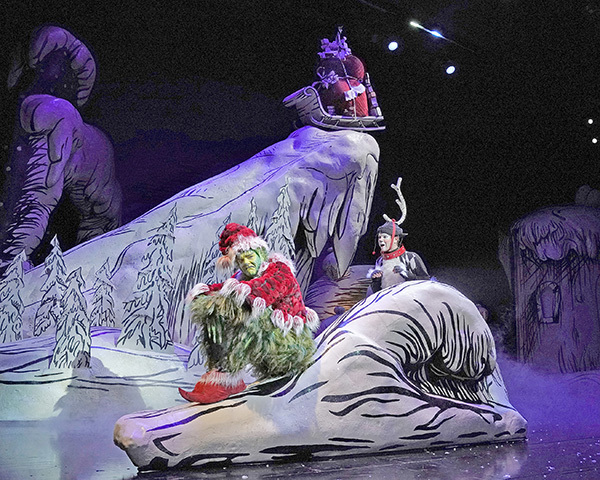 When Christmas Day arrives, the Grinch eagerly listens for weeping and wailing from Whoville. But he’s shocked to hear them singing. It makes him wonder if maybe Christmas doesn’t come from a store. 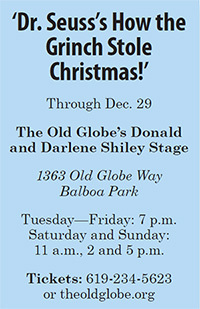 This is The Old Globe’s 21st iteration of this Christmas tradition. By now there are regular cast members, some of whom have played more than one role over the years. But this whole cast — regulars and newbies — is excellent. And so is the fine orchestra led by Elan McMahan and the tech team that has been in place for some time. James Vásquez directs and has restaged some of the choreography with great élan. 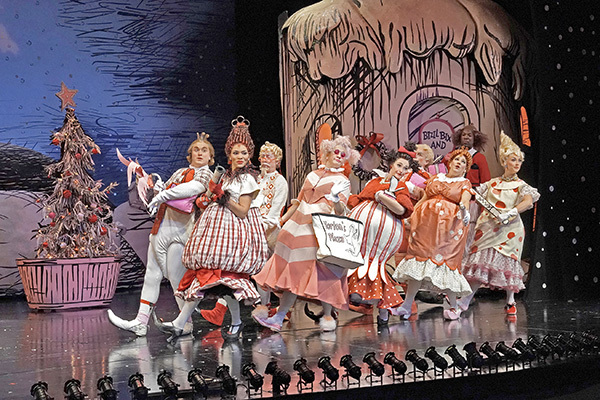 Every year the Grinch packs houses, and every year audience members leave the show with a smile, many humming the tunes. If you haven’t seen it — or even if, like me, you’ve seen every single one — grab a kid and get down to the Globe. You won’t regret it. —Jean Lowerison is a long-standing memberof the San Diego Theatre Critics Circle and can be reached at infodame@cox.net.